The safest, cleanest and easiest way to introduce solid foods into the baby’s diet. With very soft, flexible silicone. It lets your child start to eat small pieces of food without and danger of choking. As it is made of silicone it is clean and hygienic and does not change to flavour of food. It is easy to wash and no residue is left inside. BPA, PVC, LEAD, PHTHALATES and BISPHENOL FREE 100%. Ideal for when the baby starts to eat biscuits, fruit, cheese or vegetables. 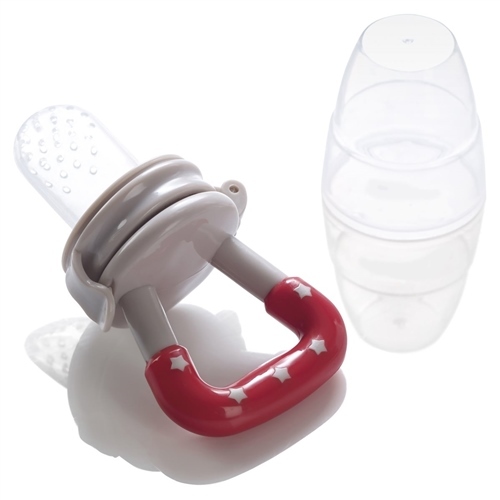 The handle is ergonomic and lets the baby grab hold of it easily. To put the food in simply lift the flap on the teat compartment and place to food inside. Then close the compartment and it is ready for use. It is fitted with a protective cover so it does not get dirty. It can be sterilised using the same methods you use for dummies and feeding bottles. Suitable from 5 months old and/or when the child can sit up by himself.